Dr Kevin Dutton catalogues examples of split-second persuasion or ‘Flipnosis’. Dutton unlocks the secrets of a baby’s face, uncovers dastardly scams and tantalises with analyses of The Psychopath. Flipnosis is an easy read that supplies intriguing anecdotes and entertaining experiments to relay to the amazement of your friends. What Dutton lacks is consistent relevance to his primary theme or the ability to follow through on his allusions to being able to teach the reader to become an expert ‘Flipnotist’. This leaves what is simply a pretty enjoyable regurgitation of other people’s ideas, with a catchy title, but no real purpose. 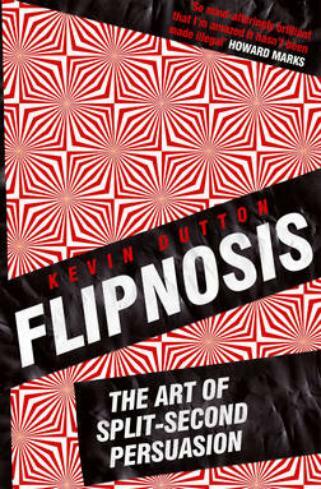 You are currently reading Flipnosis by Kevin Dutton Review at booksbeccabuys.